"Like Documenta, the Gwangju Biennale in South Korea was also initially prompted by a tragic historic event. The massive quinquennial Kassel exhibition is the world’s most important art event and evolved in reaction to the WWII bombings that destroyed almost the entire city centre. The Gwangju Biennale was founded in 1995, commemorating the student uprising that began on 18 May 1980, when the government deployed tanks and paratroopers to violently beat down on protests against the dictator Chun Doo-hwan. More than 200 civilians were killed, many more were injured, imprisoned or vanished. Numbers differ, depending on the historical source." Unidentified skulls and other skeleton parts from Gyeongsan and Jinju are faintly visible through the windows of artist Minouk Lim’s two cargo containers in front of the Biennale building in Gwangju. They are part of her new performance work Navigation ID (2014), relating to Korea’s conflict-ridden twentieth-century history. After Japan’s occupation (1910–1945), the country was racked by conflicts between the superpowers. In the ensuing Korean War, some 200,000 civilians were executed on orders from the South Korean government, for alleged communism or North Korean sympathies. At the time, US troops near No Gun Ri killed at least 300 civilian refugees. Not until Associated Press brought this to world attention in 1999, was the massacre discussed in the South Korean media. Like Documenta, the Gwangju Biennale in South Korea was also initially prompted by a tragic historic event. The massive quinquennial Kassel exhibition is the world’s most important art event and evolved in reaction to the WWII bombings that destroyed almost the entire city centre. The Gwangju Biennale was founded in 1995, commemorating the student uprising that began on 18 May 1980, when the government deployed tanks and paratroopers to violently beat down on protests against the dictator Chun Doo-hwan. More than 200 civilians were killed, many more were injured, imprisoned or vanished. Numbers differ, depending on the historical source. Minouk Lim’s performance reminds visitors of the events of 18 May 1980. It also individualises the civilians who were executed during the Korea war in the early 1950s, albeit namelessly, freeing them temporarily from the rival ideologies that brutally separated the North and South Korean populations. The containers are randomly placed off-piste on the plaza, accentuating this depersonalisation. In the midst of the bustling city, these containers get closer to the non-gallery-going public. The work challenges South Korean neoliberal political rhetoric which stresses economic and material progress. Instead of processing the events, the elected representatives have hushed-up the assaults against citizens in the 1950s and 1980s. These bone-filled vessels allude to the commodities shipped across the oceans of the world. Containers adapted to the requirements of international shipping have rapidly contributed to the globalisation of trade. Here, they are a reminder both of the affluent society’s poor waste disposal, and of the crews on starvation wages on-board ships registered under flags of convenience. Jeremy Deller, Untitled, 2014, print on flex canvas; Minouk Lim, Navigation ID, 2014. Gwangju Biennale's plaza. View of containers from Jinju and Gyeongsan with remains of civilian massacre's victims during the Korean War 1950. Minouk Lim, Navigation ID, 2014. 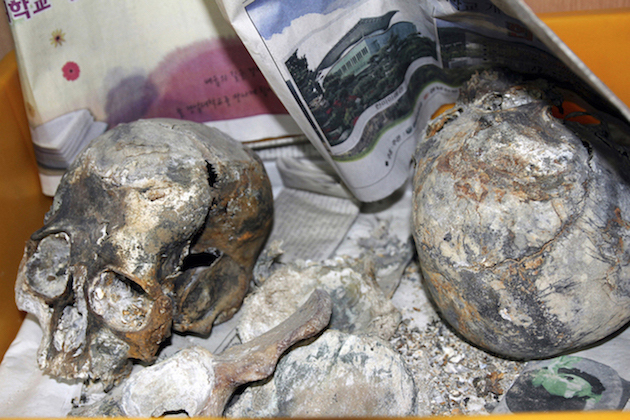 View from inside of Jinju container's shelves, the remains of Jinju civilian massacre's victims during the Korean War 1950. Excavation date: 2014.2.24~3.2. Courtesy of Minouk Lim. Photo by Minouk Lim. 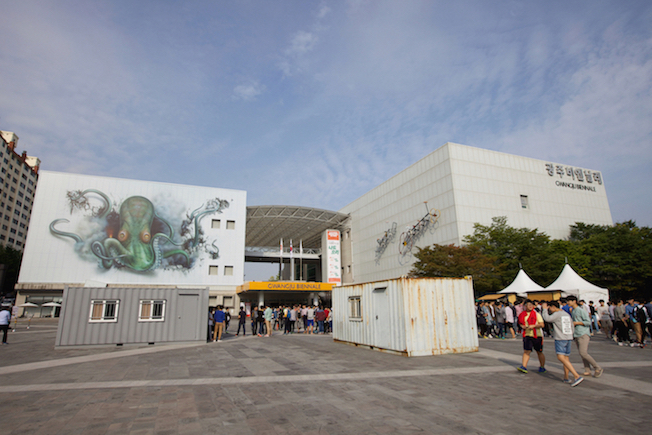 Some thirty artists at the Gwangju Biennale are South Korean. Two of them, the women artists Minouk Lim and the internationally-established Lee Bul, are extensively featured as figureheads of the exhibition. The internet publication Artnet News ranks Gwangju fifth among international ennials, ie regularly recurring large-scale exhibitions. Outside Europe and the USA, they are number one. The latest Gwangju Biennale ingeniously highlights Asian and non-Western art, while discussing South Korea’s history. The 2014 Biennale had some 200,000 visitors in sixty-six days – a daily average exceeding 3,000. The Venice Biennale in 2013 had more visitors in total and lasted for nearly six months, but had lower daily visitor numbers. This gives some indication of the Gwangju Biennale’s status and attraction, despite not having the same interest for international mass tourism. An analysis of the latest Biennale in Gwangju requires a short background on the drastic social changes in South Korea since the early 1980s. In only a couple of generations, South Korea has transitioned from a poor agrarian society into one of Asia’s richest and most densely populated nations. Travelling through the mountainous landscape, I see clumps of white high-rise buildings that remind me of inexpertly inserted dental implants. Shooting out of the earth like fast-growing bamboo after a rainfall, their floor levels resemble nodes on the plant stems. Samsung’s spectacular art museum Leeum, in Seoul was designed by the European architects Mario Botta, Rem Koolhaas and Jean Nouvel. To be on the safe side, the mighty South Korean company employed three internationally renowned masters. Leeum’s facade presents the nocturnal wanderer with a bright neon legend: memories of the future. The title of French artist Laurent Grasso’s work proclaims: forget the nation’s destructive past but remember its leap towards a brilliant future. The Gwangju Biennale also aims for the stars now that the old social structure has been razed. Many of the artists at the Biennale do backward somersaults to erstwhile politically charged events in South Korean history, specifically in Gwangju, exploring them from their foothold in contemporary radical culture. Laurent Grasso, memories of the future, 2010, Leeum, Seoul. Photo © Christian Chambert. Jessica Morgan, from the UK, is the first woman to have primary responsibility for the Biennale. Previously, top curators Okwui Enwezor and Massimiliano Gioni have contributed to the event’s international recognition. With the exhibition title, ‘Burning Down the House’, Jessica Morgan asserts a tabula rasa philosophy, where old structures are wiped out in favour of viable initiatives. Diligently, she has amassed works that somehow relate to houses or fires, not always contributing to the overall meaningfulness of the exhibition. The Biennale has borrowed its title from a Talking Heads track from 1983, which embodies the ambition of the new wave to combine lyrical complexity with social commitment, which, unfortunately, ends in a mantra about setting fire to a building. A more pertinent wakeup call would have been a reference to Marquis de Sade’s Les 120 journées de Sodom (The 120 Days of Sodom) from 1785, where Judge Curval, in an oft-quoted passage, wants to destroy the sun or use it to set the world ablaze. South Korean Hwang Sok-yong’s long novel Oraedoen chǒngwǒn (The Old Garden, 2000) is an excellent starting point for learning about Korea’s modern history and gaining a deeper understanding of the Biennale’s theme. The main protagonist O Hyǒnu is arrested for participating in the 1980 rebellion in Gwangju and Seoul. On his release after eighteen long years in prison, he returns to his former hideout, where the farming village has been replaced by high-rise buildings, and the love of his youth, Yunhŭi, is dead. The idealists eventually get the change they fought so hard for, but new problems loom. The book points out the minimal role of enthusiasts in the fight between autocracy and extreme market liberalism. Huma Mulji, Lost and Found, 2012, fibreglass and buffalo hide. Photo Credit: Stefan Altenburger. A commemorative exhibition held in conjunction with the Biennale (‘Sweet Dew – After 1980’) at the Gwangju Museum of Art, was subjected to severe censorship and duly boycotted by several artists. When news of the decision to withdraw Hong Sung-dam’s painting broke, numerous artists withdrew from the show, several others pointedly obscured their work with anti-censorship messages, a key loan was cancelled and the respected president of the Gwangju Biennale Foundation, Lee Yong-woo, resigned. When the piece was first revealed to GMA officials, just hours before the 8 August opening, according to the biennale foundation, the museum called a meeting with foundation leaders to discuss whether the painting should be included. At this meeting it was decided that the question should be deferred to a public forum on 16 September. The artist then withdrew the painting. There is no information as to exactly when the painting was withdrawn. The controversy concerned Hong Sung-dam’s more than ten-metre long painting Sewol Owol. South Korea’s woman president, Park Geun-hye, is identified as being responsible for the major ferry disaster off the South Korean coast in spring 2014 which claimed the lives of 250 students. 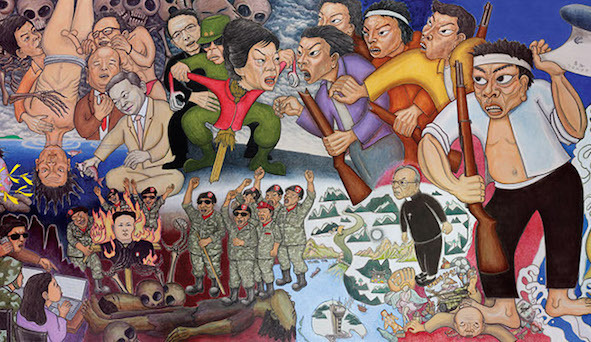 In the censored painting, Park morphs into a furious scarecrow held tight by her father, the dictator Park Chung-hee, whose regime provoked the student rebellion in Gwangju in May 1980. The artist short-circuits the 1980 rebellion with the sinking ferry disaster, in both cases ruthlessly criticising the same long-lived presidential family. Apparently, more presidential palaces should be burned to the ground, at least symbolically. Hong Sung-dam, Sewol Owol, 2014, acrylic on canvas, 290 x 1260 cm, © and photo © the artist. Detail from Hong Sung-dam, Sewol Owol, 2014, acrylic on canvas, 290 x 1260 cm, © and photo © the artist. One way of effectively making people feel shame and lowering their self-esteem is to compare them to animals. Pakistani artist Huma Mulji’s fibreglass work Lost and Found (2012) blends the human and animal genomes. 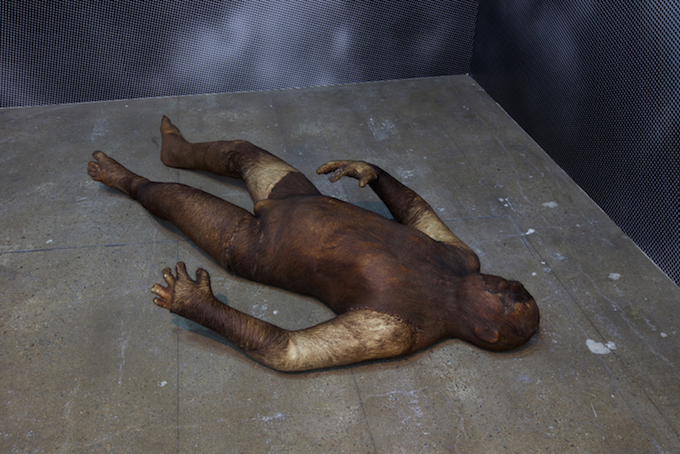 A humanoid form is covered in buffalo hide turning it into a hirsute beast. The work challenges normality and our fear of becoming monsters that can take control over our lives. The bestial creature is uncanny not for being bestial but for partaking of human form. The Pakistani secret service are searching for alleged terrorists, the suspects are tortured and murdered; this dehumanisation, literally ‘making animal’, could be seen as the authorities justification for their actions. A twist in this sinister masquerade is that the buffalo is part of traditional, safe rural life in Pakistan. Against this stands the abandoned, anonymous, water-bloated man thrown into the canal from the back of a lorry. Renata Lucas, until it becomes an inconvenient stranger, 2014, architectural intervention. © Stefan Altenburger Photography. Brazilian Renata Lucas captures the social situation in South Korea by quoting the Greek poet Constantine Cavafy: until it becomes an inconvenient stranger. She inserted an oblong window in the Biennale building’s south blind wall, mirroring the windows of the architecture facing it. 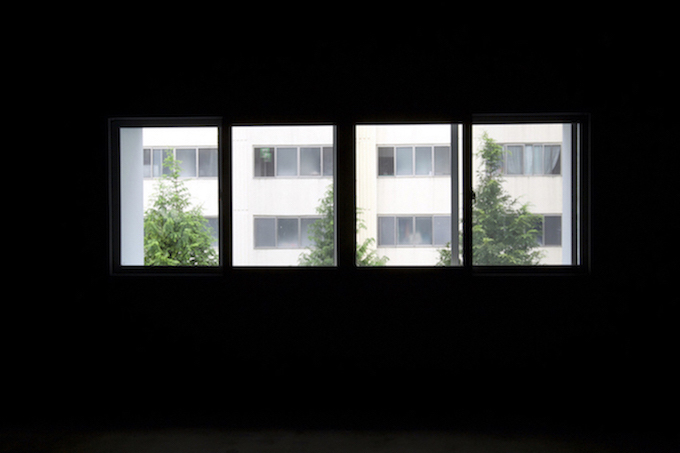 The installation refers to apparently endless rows of similar windows in standardised houses scattered across South Korea. Lacking aesthetic features or attention to detail, the high-rise structures are reduced to mere dwellings. Only the large number plaques and the property owners’ logotypes high up on the facades distinguish them from one another. Lucas work highlights the enormous need for housing in the wake of rapid population growth, while levelling a subtly poignant warning against conformity, alienation and high-rise developments. Carsten Höller’s seven electronic, mirrored sliding doors at the exit open one by one as I approach, only to shut behind me. The organiser stresses that the way forward is what counts. A Biennale host stops visitors from retracing their steps through the exhibition about the burned-down house, a parallel to Lot and his family escaping while Sodom and Gomorrah go up in flames. Disobeying God’s command, Lot’s wife turned back towards the past, the burning cities, and was transformed into a pillar of salt. 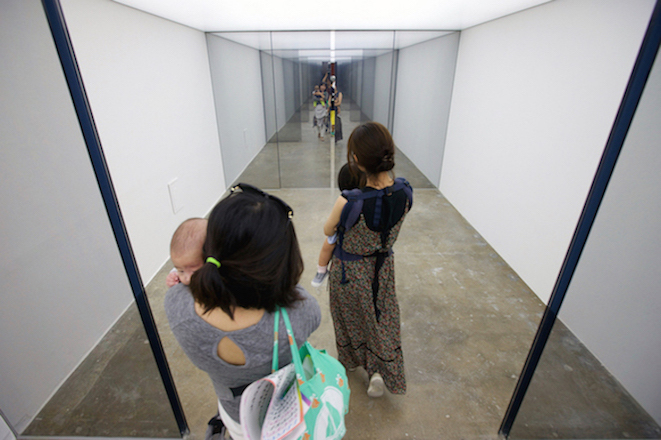 Carsten Höller, Seven Sliding Doors, 2014, steel, glass, mirror foil, electric motors, door mechanism, wiring, fabric, lighting, movement detectors, length 25,2 m (distance between two doors 4,2 m), height 2,4 m.
The 10th Gwangju Biennale: ‘Burning Down the House’, ran from 5 September to 9 November 2014 in Gwangju, South Korea. Burning Down the House: Gwangju Biennale 2014, exhibition catalogue, 2014, Damiani srl, Bologna. www.damianieditore.com, was published after the end of the Biennale. Christian Chambert is an art critic and art historian living in Uppsala. He was President of AICA Sweden 1978–2013 and organized the AICA Congress in Stockholm and Malmoe in 1994. Together with Katy Deepwell, Kim Levin and John Peter Nilsson he was the editor of Art Planet (1999) and was the editor of Strategies for Survival – Now! (1995). He has written for Colóquio Artes, Hjärnstorm, Neue Bildende Kunst, Nka Journal of Contemporary African Art, NU: The Nordic Art Review, Paletten, SIKSI and Taide, among others. He chaired AICA’s Website Commission (2012–2015) and is chairing AICA’s Sub Commission on Statutes and Regulations (2013–).